A perfect welcome baby gift to frame every fascinating change to compose a lifetime memory for the little miracle in the first year. Baby Photo Memory Album is perfect to keep photos of baby's first year of life. 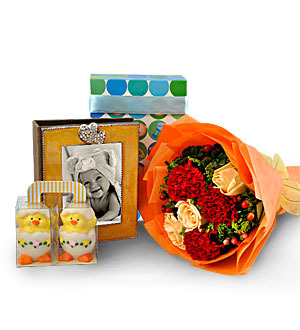 Baby Album Gift comes with a pair of Just Hatched Baby Duckie Candles 2pc and posy of Rose Flowers to greet the new family. Same-day delivery applies for delivery within Klang Valley. For outstation deliveries, fresh flowers will be replaced by artificial flowers or other baby items. At least 3 days notice is required for outstation deliveries. Call Giftlab at 03-78830233 / +6012-6915200 or email us at sales@gift-lab.com for assistance.